Bucket seats and captain's chairs are two very similar-looking types of seat found in cars, trucks, vans and other automobiles. Both types of seats are often considered more comfortable alternatives to bench-style automotive seats. While traditionally there's a distinction between bucket seats and captain's chairs; today sometimes the two are often almost indistinguishable, differing in only a few ways, such as the type of vehicle in which they are installed. Bucket seats replaced front bench seats in many automobiles in the late 20th century. Bench seats are the oldest type of automotive seat. These relatively flat seats extend the full width of a vehicle's interior and usually have no divisions between passenger seating areas, though seat belt placement tends to indicate where each person will sit, and some have a fold-down armrest in the middle that serves to separate seating. 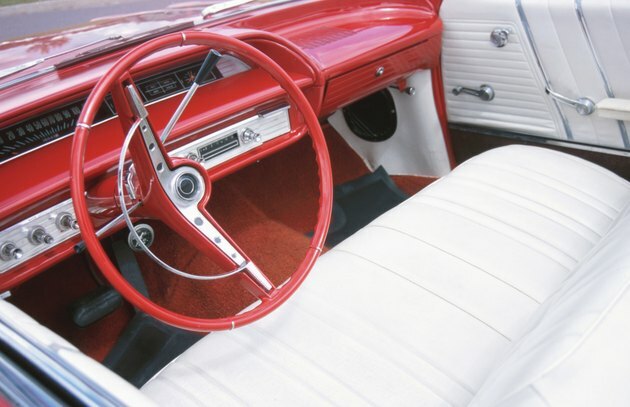 Cars in the first part of the 20th century tended to have bench seats in both the front and the back, while contemporary automobiles tend to have front bucket seats and rear bench seats. Some sportier cars have buckets in the rear seats as well. A bucket seat is a rounded or contoured seat made to fit just one person. The earliest bucket seats had fairly high sides and were named for their resemblance to buckets. Modern bucket seats have lower sides but are still contoured to fit a driver or passenger comfortably. Older bucket seats often had mid-height backs, but most bucket seats since the fourth quarter of the 20th century have been high-backed, with headrests. Some buckets are bolstered, which mean there's extra padding on the sides where the outer thighs and sides of the back meet the seat, to hold a person snugly in place in spirited driving. The captain's chair is similar to the bucket seat, since it is made to fit a single person and may have a high back. Like the wooden chairs from which they draw their names, captain's seats usually have armrests that may be adjustable or swing out of the passenger's way. A captain's chair usually has some contouring and generally has a saddle-shaped seat. Nonetheless, some auto manufacturers promote their bucket seats as captain's chairs. In some cases, a manufacturer is likely to label all non-bench seats in a truck, sport utility vehicle or van as captain's seats, saving the "bucket seat" terminology for sedans and coupes. Bucket seats are usually fitted in the front of a vehicle. Rear seating is often in bench format. In vehicles with three rows of seating, however, such as minivans, custom vans and some SUVs, the middle row of seating may use captain's chairs instead of a bench or bucket seats. Some middle-row captain's chairs swivel. In RVs, the driver and front passenger seats are often captain's chairs that swivel to face the back when the RV is parked. Some vans and SUVs offer buyers an option of bucket seats, captain's chairs or bench seating.